But a Department of Justice (DOJ) source present at a meeting between Chaffetz and Sessions told Breitbart News that Sessions did not refuse to provide documents relating to Fast & Furious. On the contrary, the source said, the attorney general indicated that he would talk to Department of Justice attorneys about doing so. Last Wednesday, nearly a year after the meeting, the Department of Justice and the House Oversight Committee reached an agreement for documents on Fast and Furious to be provided to congressional investigators. 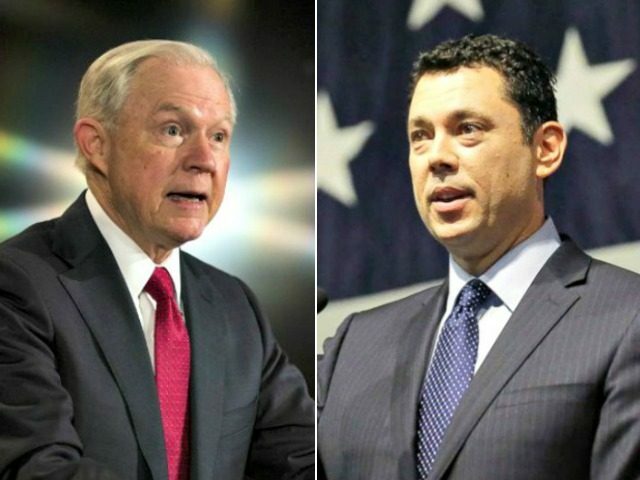 Breitbart News was provided with notes from a DOJ staffer documenting a conversation between Sessions and Chaffetz, who was then the chair of the House Committee on Oversight and Government Reform. The meeting took place on April 6, 2017, and apparently covered a variety of topics under House investigation, such as scandals within the Secret Service. But Chaffetz disagrees. “The best evidence I have is what happened,” he told Breitbart News on Thursday. Chaffetz, who left office midway through last year, had expressed his frustration with Sessions before. In June 2017, he said the Trump administration was “almost worse” than the Obama administration when it came to releasing documents relating to Department of Justice investigations on Fast & Furious and other matters. The Fast & Furious scandal involved a gun-running operation organized by the Arizona field office of the U.S. Bureau of Alcohol, Tobacco, Firearms and Explosives (ATF), within the Department of Justice, ostensibly to trace the movement of weapons to Mexican drug cartels. Critics later charged that the real purpose of the operation was to generate alarm about the flow of weapons in order to push for new restrictions of firearms within the U.S. The guns that were smuggled were used in the murder of U.S. Border Patrol agent Brian Terry, as well as the murders of hundreds of people in Mexico. Some of the weapons were thought to have reached distant countries in South America. Then-Attorney General Eric Holder refused to provide DOJ documents related to Fast & Furious to Congress, leading to him being found in contempt of Congress in 2012 — the first Attorney General to be found in such contempt in U.S. history. President Barack Obama used executive privilege to protect some Fast and Furious-related documents, only to have a court reject that claim, whereupon those documents were provided to Congress. Chaffetz said that he had expected Sessions to be more aggressive about uncovering the truth about Fast and Furious. “I had greatest hope that a Trump administration, with a Republican attorney general would pry open the vault and expose the truth, and generally that’s not what’s happened,” he told Breitbart News. “I mean, I’m glad they’ve come to this settlement agreement, but there are still things that won’t be released, and that’s a crying shame,” he said.